Heading home for the holidays? So is everyone else, it seems. The American Automobile Association (AAA) released its end-of-year holiday travel forecast yesterday, and the organization projects that more Americans will be flying and driving this year compared to last year. 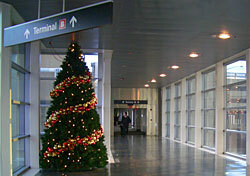 In fact, AAA expects the number of holiday travelers to come within half a million people of the decade’s busiest holiday season back in December 2006/January 2007. Roughly 93.3 million people (a 1.6 increase over the number of people traveling last year) will be heading more than 50 miles from home between December 22 and January 1, according to AAA. Median consumer travel spending is also up, at $759; compare this to last year, during which median transportation costs came to $718. Though about 90 percent of travelers will be driving, air travel rates are on the rise, with a 5.6 percent increase over last year. Perhaps the uptick in end-of-year travel is due to favorable airfare and gas prices. AAA says that gas prices should drop slowly toward the end of the year, and airfares have decreased by about 3 percent compared to last year.